This past week, the addiction issues at the house came to a head again, and sadly we had to ask two people to leave. We will truly miss them; we already do. But facing the truth and its consequences are part of living responsibly as a community together. We hope with all our hearts that these friends will be back someday. Also, this week, my son Joe came home briefly and brought home with him two other difficult stories I want to share with you. One was a chance meeting with some migrant workers at a bus stop in Atlanta a few weeks ago. The bus was terribly late, and there were a number of folks stuck waiting at the station who did not speak English and were baffled about what to do after four hours of waiting. They had left jobs in one place to find work in another (the plight of migrant workers), but if they didn’t arrive on time they would lose those jobs. Joe translated their concerns to the desk clerk, who was “not helpful.” The clerk said he had no idea about the bus (although he had announced every hour for the last four that the bus would arrive in approximately 20 minutes) and said he could not refund their money. Joe spent the wee hours of that morning talking with two of the workers, a young couple from Oaxaca, Mexico. He said his own powerlessness within the Greyhound system really made him feel for the precariousness of their situation – new to the country, not speaking the language, desperately looking for work, having no idea what to do or to whom to turn . . . yet still more hopeful of finding work here than in their home country. While Joe felt abused by the bus situation too, he had resources they didn’t; they had emptied their pockets buying the tickets. In the end, they wound up staying in Atlanta – and they are still looking for work. Joe arranged to meet with them at the same bus stop on his way home this weekend so he could give them the English language book they had requested. They plan to stay in touch. Another story he shared was an interview he had with a former Viet Nam vet. It was part of a history class project, and he was excited to be able to interview Scott Camil, a well-known Gainesville veteran. He asked Scott to share with him not just the stuff he could get off the internet, but what it was like to be a young man in Viet Nam. The little Joe had time to share with us over breakfast just tore at our hearts. You can know the story of Viet Nam or any war – its statistics and strategies, its motives and historical impact. But there is nothing like looking into the eyes of a person who has borne some of the brunt of it. The death and destruction he witnessed and participated in at such a young age – and the struggles and persecution he faced when he told the truth of his experience – had a tremendous and ongoing effect on his life. Today, he is still struggling to make some sense out of it – and to somehow redeem his own participation in it by telling the truth every chance he gets. What do we do with these stories? They are part of who we are as a community and as a country, but they are so painful. Joe said he could understand why Scott might fall completely into despair after having experienced what he did. But Scott found the heart to come to terms with it and to face down the painful truth by telling it. And the two Oaxacan immigrants, struggling to get by in a strange system where their labor is needed but not respected have the heart to befriend a college student passing through the same bus station. As for the addiction issues… I still don’t know where to find heart in it. I do believe it is good, though, to face such a sad issue straight up, good to offer help whether taken or not, good even to suffer the consequences we all make ourselves vulnerable to when we face a difficult truth. As Christians, we profess to believe that walking with people in their struggles is a way we can follow Jesus in the here and now. Jesus put himself in places where the difficult facts of human existence were apparent. He shone a light on hard and ugly truths people would rather not have seen. Dorothy Day often quoted Dostoevsky: “Love in practice is a harsh and dreadful thing compared to love in dreams.” That truth is glaring on Good Friday when we contemplate a love that brought Jesus to the cross. But we remember at Easter that truth and goodness – God – prevailed. May God be with all of us this Easter season and may we all – such a struggling lot – be somehow transformed into Easter people, brimming with life and hope. 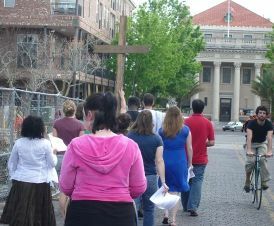 Today is the the Gainesville Catholic Worker/Pax Christi Gainesville’s annual Good Friday Way of the Cross at 4pm. 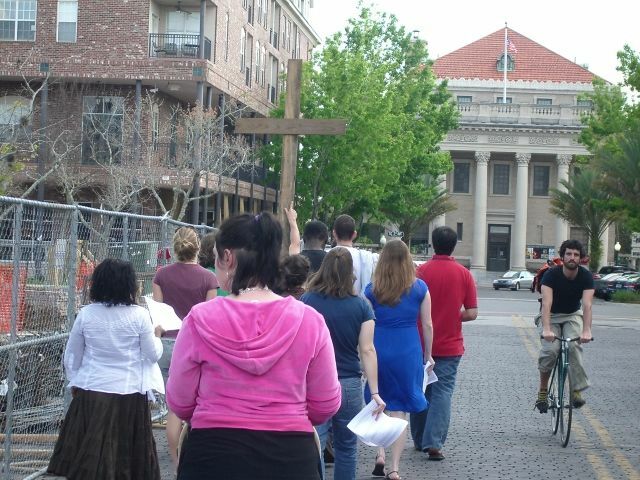 We will walk the “Way of the Cross” through downtown Gainesville, praying at sites where Christ continues to be crucified today in the most oppressed, suffering and impoverished amongst us. This is often a powerful experience of “public prayer and witness,” recognizing that our faith is expressed in our willingness to walk and work alongside our brothers and sisters who suffer because of injustice, violence, and greed. We encourage you to join us for this experience. 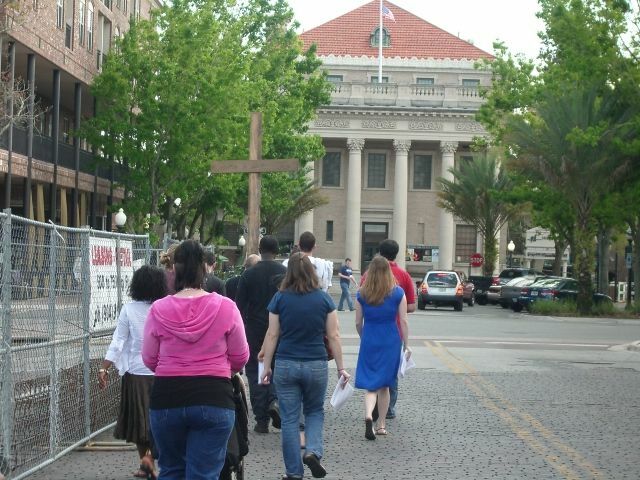 We will meet at the Gainesville Catholic Worker House at 3:45pm and begin walking at 4pm. We will walk about 2 miles over approximately 90 minutes and end back at the GCW. The sixth chapter of Matthew’s gospel opens with Jesus addressing what have become the three hallmarks of Lenten observance in the Roman Catholic and other Christian traditions: prayer, fasting and almsgiving. Interestingly, the first of these that Jesus addresses is almsgiving. The first thing that strikes me about the passage is the assumption Jesus makes that performing “righteous deeds” is part of one’s life of faith. There is no “If you are going to perform righteous deeds, then. . .” Jesus asserts simply that any disciple of his WILL perform righteous deeds; it was part and parcel of sincere Judaism during Jesus’ day and it can be assumed that for those who follow Jesus today, righteous deeds are a regular practice of sincere discipleship. But it begs a further question: In the Judaism of Jesus’ time, who was almsgiving aimed at? The Hebrew Scriptures suggest that almsgiving was a practice focused on a particular class of people usually referred to as “the widow, the orphan and the stranger,” three archetypes of people within ancient Hebrew society which would find themselves in an incredibly vulnerable position. Widows, orphans and strangers (i.e. foreigners within Israel) were particularly vulnerable to financial and physical threat because they had no one to speak for them, or to defend them. They were outside the stabilizing and protective circle of “family” or “tribe” or later, “nation/state.” So it is important for us to recall the context for almsgiving during Jesus’ time, and to ask ourselves whether our “righteous deeds” today are performed for the uplift of those who are most vulnerable among us and least protected by our circle of family, community, society or nation. Those words—“alms” and “almsgiving”—are not words we use much anymore. Many would substitute today the word “charity.” But the first verse employs a Greek word—Dikaiosynē—which translates to “righteousness/righteous deeds” or “justice/just works” which connotes that what happens in this practice is not simply “charity” in the way we have come to understand the word today. Rather, there is also a note of “justice,” of redressing the wrongs that play themselves out in our political, economic and religious systems. Acts of charity today are often done with an implicit quid pro quo—sure we do something nice, but we also get something back for it. Sometimes it is a tax break; others it is the admiration or acknowledgement of friends and community. But in Jesus’ sermon, the “rightness” of the act is sufficient in and of itself as far as things go here on earth; any reward here too easily leads to a corruption of the goodness of the act apparently. The thrust of the passage – that doing good in order to be praised or rewarded for it— is a warning to those who are listening to Jesus. It is a “false pride” that ensnares us when we receive adulation for our good work. Such adulation and the false pride it engenders takes away from the importance of “doing justice” in and of itself. The issue is that we have directly or indirectly benefited at the expense of others in our society who go without enough food, or care, or love, or security; and our “almsgiving” is not to be praised, but rather the simple practice of healing our societal brokenness, correcting inequities among us, redressing wrongs. This isn’t something to be praised; it is simply something that good people—including those who would follow Jesus—should do. The final point in this opening passage of this section is that Jesus also puts on the listener the responsibility for performing such acts. The act of doing justice, giving alms is not left to one’s church or one’s government or some other institution. It is a personal responsibility of each and every person who walks this way with Jesus. It cannot be passed on to another level but must be practiced oneself. Such practice, if it becomes second nature to us, fulfills the meaning of verse three: “do not let your left hand know what your right hand is doing.” Our practice is rooted in our integrity, it becomes natural to us, without thought eventually, simply part of who we are and what we do. Last Thursday Joan Prado, who has worked for many years for the Department of Labor, led a discussion on immigration. She described the current political atmosphere and attitude toward undocumented migrant workers and also the harsher penalties being considered for “illegal aliens” and those who employ them. The conversation around the issue was particularly interesting because of the diverse experience of the folks at the table. Joan pointed out some of the misinformation we regularly hear: that these people do not pay taxes for instance – which they do through their employers; and that they are taking jobs away from American citizens – when her perception was that they were taking jobs (and hours), as farm workers, that no one else wanted. Several folks who work at labor pools in construction pointed out that they felt they had lost jobs they were seeking in construction when Latinos, who were willing to accept much lower wages, were hired before them. These folks understood the desperation of people who have traveled so far from home to work but were feeling the pinch because of it. This led to a discussion about the loss of production work in the U.S., since so much has been sent overseas to lower paid workers in order to increase profits for shareholders (at the expense of the workers who relied on that work to take care of their families). It made us wonder how the resentment between workers will grow if the economy continues to falter. And if there’s anything we can do about it. Toward the end of the discussion, someone pointed out that there were probably not five items in Jubilee House’s large dining room that were made in the U.S. Are there ways that our habits of consumption are supporting this system that is causing harm to some of the most vulnerable people? How much of it is so far gone that we are locked into a system of supporting unfair practices in other countries, as well as our own? Do our own spending patterns mirror the greed (in a very reduced way) that motivates corporate execs to abandon factory workers here to increase their own profits? It also raised the question of what is going on with the migrant workers’ home country’s economies that they are forced to travel so far from home and family – and often at extreme risk – to find work. 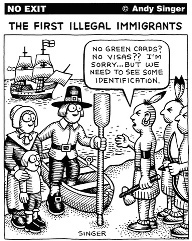 One friend from the labor pools, experienced in construction work, put it clearly: “If you’ve got a leak, you don’t keep mopping up the mess, you look for the source.” This made everyone consider whether our time and energy prosecuting illegal immigrants might be put to better use helping support their home countries’ economies. We ran out of time too quickly, but I think we came away from this roundtable better informed by the various viewpoints – and the complexities of the issue. 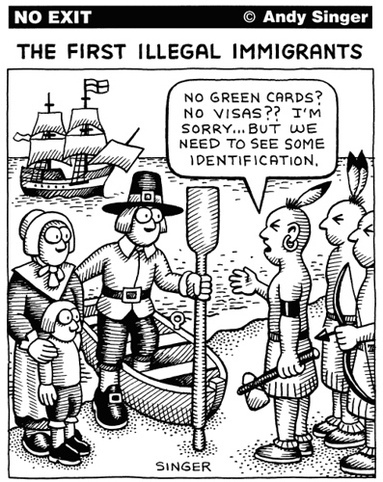 We’re hoping to revisit issues surrounding immigration soon. Disturbing, but that was the understanding we came away with after last Thursday’s roundtable discussion led by Joe Jackson. Joe is a professor at the UF Law School and regularly offers his services to homeless folks as well as to those who try to help them. Megan, a UF student, brought up the question of how we define the needy. Are poor students on financial aid needy? Or is it the way people dress? Where they live? And this seems to point to the concern behind the concerns. What is the real problem with serving a meal to a hungry person – or to many hungry people if there are a lot out there? Or with offering shelter to someone who has no place to sleep or come out of the rain or cold? Downtown business people and homeowners associations carry a lot of clout with the commission. But however they dress it up, the main concern is neither with a church’s ability to adequately care for needy people nor with public safety of downtown shoppers and nightclub frequenters or families living near neighborhood churches. Churches and religious groups have done a good job of stepping up and filling in when the city started restricting services at St. Francis House – our city’s homeless shelter. And there are laws on the books to protect people and property from individuals who are disruptive, dishonest, or dangerous. The fact that downtown bars that encourage irresponsible drinking and the dangers (and annoyances) that accompany it – drunk driving, brawls, public urination, littering, and other irresponsible and harmful behaviors — operate with little interference from the city, lays the lie to the public safety concern of many of the people who are complaining the loudest about churches. The bottom line seems to be… the bottom line. Business owners are concerned about the down and out detracting from downtown’s ambience, and homeowners are worried about property values. It’s money. And it’s us. If you repeat something often enough, people begin to believe it. “Most homeless people are ‘transient vagrants’ who choose to live that way;” “Downtown is dangerous because of all the ‘homeless people;’” “If you feed them, you just encourage them to stay around here rather than moving on.” All these statements smack of bigotry and recall times past when it was common for white people to make assumptions about black people and their presence affecting property values and “our” lifestyle. If we made the effort to get to know people, we would know – like Joe – that homeless and hungry folks are pretty much like “us.” They’re a mixed bag of people trying their best to cope with the hardships in their lives. People living on the streets have suffered almost insurmountable hardships: debilitating mental or physical illness, abuse, addiction, poverty, unemployment and other human failings and vulnerabilities. What should the attitude of those of us who are getting by be toward our neighbors who are struggling? Shun them? Send them packing? Keep chasing them out of the “safe spaces” they’ve found on their own? Make it illegal for folks who want to help to be able to do so? Some community. It’s as wrong to treat the poor and “needy” as second class citizens as it is to treat someone with a different skin tone that way. We can do better – as individuals and as a city. The next city commission meeting dealing with this issue was postponed. Stay posted for the new time. Joe said it would make a difference to the city commission if many of us attended. For our part, we can show up being as passionate about the well-being of our brothers and sisters as we are about our bank accounts. It’s no secret that a lot of homeless folks are addicted to either drugs or alcohol. The ways they got there are as various as anyone else’s. But the toll has been higher; it’s left them high and dry, wasted, alone, and needing another hit. Badly. It’s easy to judge, especially for those of us whose addictions are culturally sanctioned – junk food, television, shopping… and/or alcohol or pills behind closed doors (because we have doors). And it’s a fact: addiction is wrong. It puts some people in jail and it kills others. And it is always de-humanizing. It strips us of our ability to act responsibly, even morally. Like Edward in the Chronicles of Narnia or Gollum in the Lord of the Rings (handy references for folks who don’t know an addict – or think they don’t), we would sell out our sister or our brother or our souls to get that thing that literally means the world to us. Personally, we are experiencing this in all aspects of our lives right now. The Gainesville Catholic Worker is struggling with finding ways to treat folks who are addicted to drugs or alcohol with both mercy and responsibility. Those substances aren’t allowed in the house, and no one living in the house is supposed to be using illegal drugs or entering the house under the influence of anything. There are too many people struggling with this to allow what some people even consider fairly normal use – wine at dinner or parties, etc. And we try hard to treat guests and visitors with respect and dignity, whatever their addiction. We are also experiencing this in our family life as Ben deals with the painkiller addiction that his cancer treatment left him with. If you are inclined to let Ben off the hook and differentiate him from other addicts, he would be the first to tell you not to. A lot of the folks you see weaving in the streets started out their drug use for the “legitimate” pain and trauma caused by accidents and illness. Even more sought emotional relief, like Ben,from a substance that was available to them. Ben will also be the first to admit that, if he didn’t have family, insurance, or other resources at his disposal, he could be out on the street too. That is a fact, but it doesn’t really help. We are as helpless as any addict in the face of addiction when it comes to dealing with addicts – whoever they are. They have to hit “rock bottom;” they have to decide they want help and find within them the humility and heart to ask for help. And we have to wait and hope and hold them accountable, while offering alternatives and “tough love.” And we try to recognize ourselves, or a loved one – or Jesus – in the brokenness of it all. I don’t know what else. I wish I did.